Burlington's Amy E. Tarrant Gallery is hosting something of a coming-out party for the world's largest collection of contemporary Vermont art. "The Waskowmium: Where the Art Stops" presents a tantalizing selection of works from a trove that many have heard about but few have seen. Judging by the turnout for avid collector Mark Waskow's talk last Saturday, the art community is curious about his collection. Nearly 100 locals crowded the Main Street gallery and craned for views as he offered background information on each of the displayed items. The Barre-based financial adviser noted that the 45 paintings and sculptures lining the walls represent .003 percent of the 15,000 works — most by living Vermont artists — that he has purchased since 1998. That's the equivalent of acquiring 2.5 works of art every day for 17 years. And it doesn't include his collections of art postcards, brochures, catalogues and other ephemera. Waskow stores his hoard at nine locations in Vermont and New York that he does not disclose for security reasons. None of his purchases was especially expensive, but the collection itself is worth more than $1 million. Works of art are just the most recent expression of Waskow's lifelong fetish for collecting and arranging objects. At age 3 he started collecting bugs, rocks and seashells. Later came certain antiques, including items affiliated with his previous career in the insurance industry. Not until he reached his forties did Waskow begin, serendipitously, to amass artwork. He and a date had decided to spend a September evening in 1998 at the South End Art Hop. Waskow was instantly smitten by what he saw at Pine Street art studios. His sense of aesthetics was undeveloped at that time — "I couldn't even spell 'art,'" he said with characteristic self-deprecating humor — but he knew what he liked. 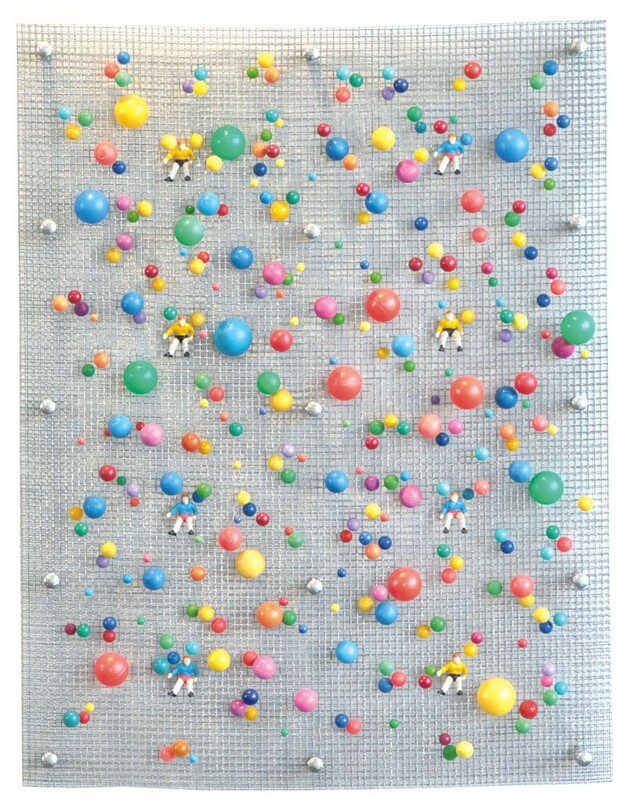 On the spot, Waskow bought "Happy Days," a wire-mesh assemblage of colored balls and figurines by Dave Huber, who died a few years ago. Since that first, fateful encounter with Vermont art, this white-goateed mensch from Brooklyn hasn't stopped. He's now president of the board of the South End Arts and Business Association, which produces the Art Hop. In addition to going on art-buying sprees, Waskow has schooled himself over the years, collecting a massive personal library of more than 35,000 art publications. He also self-teaches by fixating on individual works. Pausing in his Tarrant tour alongside Gerrit Gollner's "Kelston #2/5," Waskow recalled that he spent several hours sitting on the floor in a space at Saint Michael's College staring at the oil-over-lithograph abstraction "until I understood it." This show's sampling — chosen in collaboration with Tarrant gallery curator Nancy Abbott-Hourigan — reveals that Waskow's tastes are eclectic but not indiscriminate. The full collection consists mainly of paintings composed by traditional methods. Waskow says he isn't a fan of digital art — "I'm not really into technology," he explained — but he does buy pieces that make noise or give off smells. He clearly enjoys exuberant expressiveness and has a populist sensibility that favors outcome over technique. He said it doesn't much matter to him whether an artist is skillful as long as he finds that artist's creation to be intellectually intriguing and/or visually stimulating. Nevertheless, the show does include several works by well-trained hands. Among them is Dan Stermole's "Hermit Thrush w/ Bumblebees." This meticulous watercolor-and-pencil composition from 1992 depicts a bird in flight, wings and legs extended, as viewed from below. A sketch of a giant claw, clearly not that of the small bird, is appended to its body. Two bees float above the thrush, and a skeleton of a pelvis has been penciled into a corner of the sheet. In the show, Stermole's piece is smartly paired with Robert Carsten's "New England Weathered," an ink-on-paper work also made in 1992. In an austere style similar to that of Andrew Wyeth, Carsten details a gnarled piece of wood in stark isolation against a white backdrop. A dragonfly is perched on one end of the fallen branch, while three fungi, together resembling a coiled snake, protrude subtly from the other end. Nearby hangs a riveting piece from 1990 by Michael Oatman that combines paint, ink and a Xerox print on tracing paper. 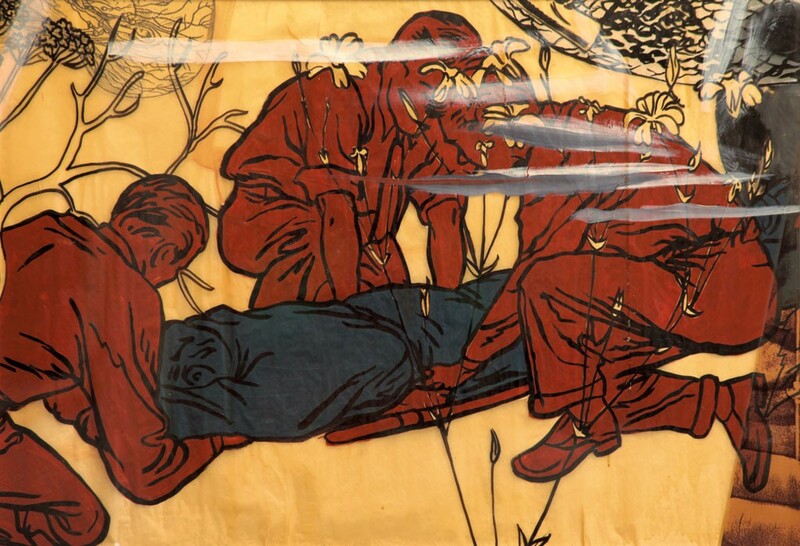 In a quasi-representational manner, it shows three medics, partly streaked with cloud-like wisps, placing a body bag on a stretcher. Formerly a lecturer in art at the University of Vermont, Oatman now teaches architecture at Rensselaer Polytechnic Institute in Troy, N.Y. Waskow describes him as "probably the person represented in the collection who's closest to being a mainstream, career-successful artist." "The Waskowmium" presents technically proficient artists outside the representative realm, as well. Paul Calter, for example, painstakingly applies his knowledge of mathematics and physics to "Vanishing Point III." In the accomplished study of forms in space, shards of aluminum and copper in different sizes are pointed, arrow-like, from above and below toward a brightly lit horizontal slit. Not all of Waskow's acquisitions are contemporary. Rebecca Merrilees, who painted in obscurity in Northfield for 70 years, is represented by the surrealistic "Pearly Glacier" from 1948. Merrilees was the subject of a career retrospective at Studio Place Arts in Barre in 2012, the same year she died at age 90. Waskow has also acquired a charming etching that Thomas Waterman Wood made in 1839 at age 16. "Man with a Pipe" shows a boy in a straw hat whose face and shirt are illuminated by a match cupped against his chest as he lights a corncob pipe. Wood, a Montpelier native, ranks as one of the foremost American genre painters of the 19th century. 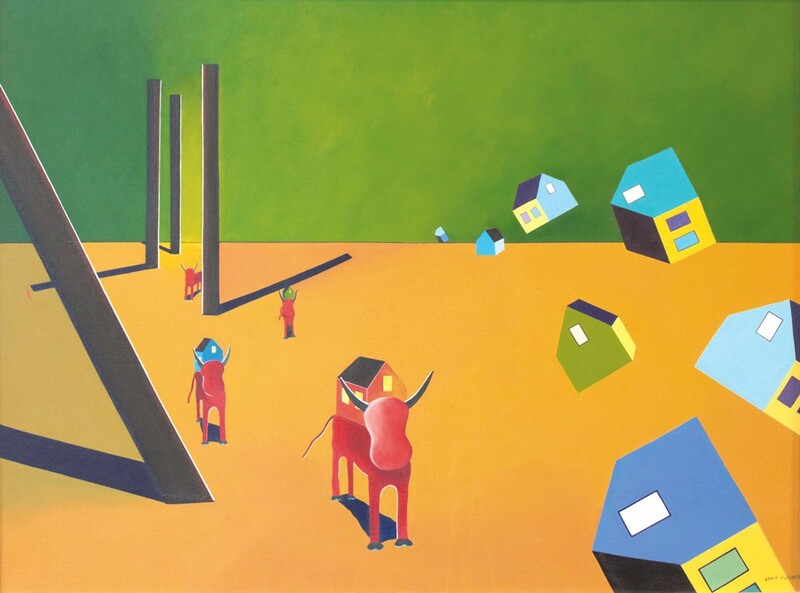 The Tarrant show also features work by some locally well-known living artists, including Ethan Azarian, John Brickels, dug Nap, Carol MacDonald and Leslie Fry. Mostly, though, Waskow buys art that "no one knows about." The 58-year-old collector added that he wants to see "if, over time, my vision is vindicated." Waskow hopes that the public will one day have the opportunity to gauge his perspicacity as well as the quality of what he's acquired. 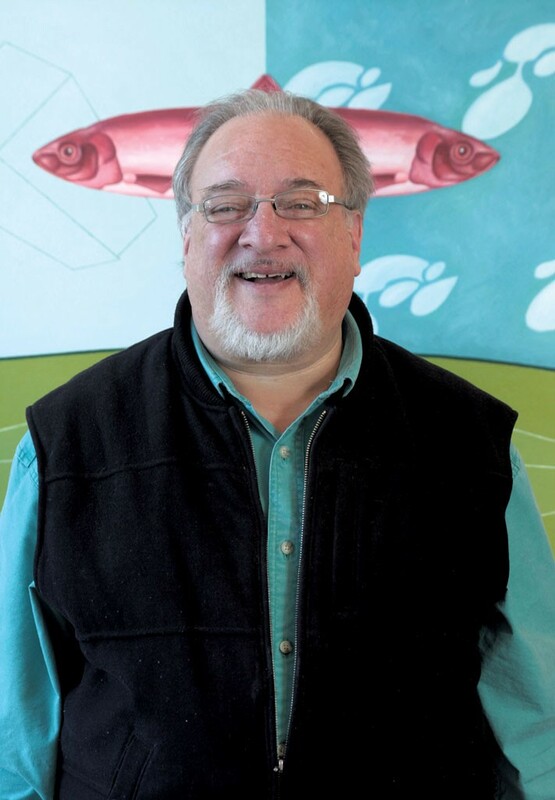 He aims to establish a museum of northern New England art, most of it made in Vermont since the 1990s, in either Washington or Chittenden county. A listener at the Tarrant Gallery asked him when the Waskowmium might open. "Just as soon as someone gives me a suitable, unused industrial building," Waskow replied. The original print version of this article was headlined "The Passionate Collector"